I am midway through posting a series of 3 refashions that have everything to do with buying clothes that don’t work for my body, not wearing them and then chopping them into something else. That’s the story with this dress. I bought it at West 49 a couple of summers ago while out shopping with my teenage kids. Note: teenagers do not always tell you when something doesn’t look right on you. I almost don’t want to post this because I cannot stand the way I look in this dress. This was a trying summer for me. There was a lot going on in my life. When there’s a lot going on with me, I develop a huge problem. I cannot stop stuffing myself with all forms of junk food. The problem dress: bodice too tight, length way too short, straps too thin. OK, so there it is. I cannot put into words what it feels like to look at this. There is so much wrong with this dress on me. 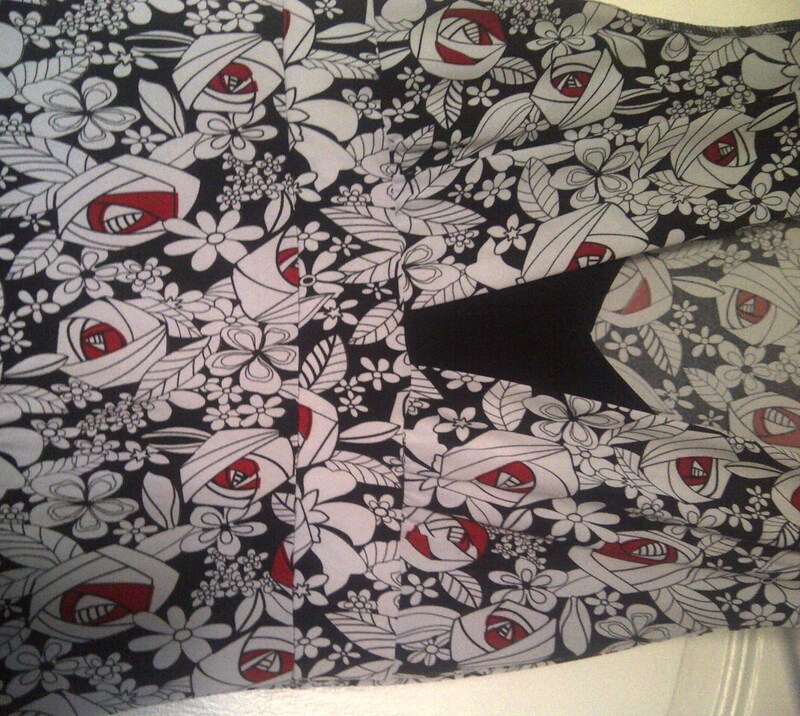 I really liked the print though and I wanted it because I thought it was young and hip so I bought it anyway. Luckily I only ever wore it at the beach. I was not strolling around the mall in this. It is amazing how much refashioning and really paying attention to fabrics and drape and body shape has taught me. I know what looks good on me and what doesn’t. I know I’ll never be able to pull off certain styles and that’s okay. We’re all different. 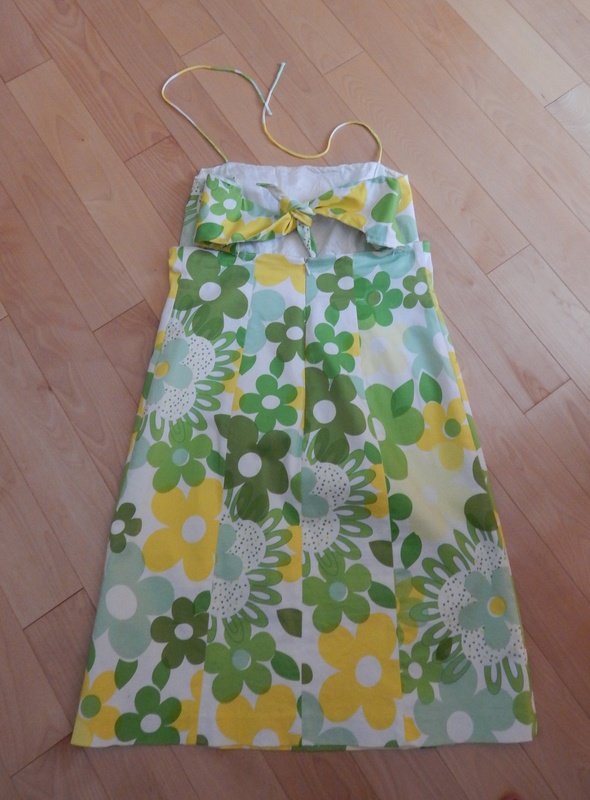 BUT…since we’re talking refashioning here, I couldn’t just throw it away or donate it just yet. I wanted to give it one more chance. I knew it had to become a skirt. I was looking for a simple restyle. Step 1: Cut the bodice from the skirt. 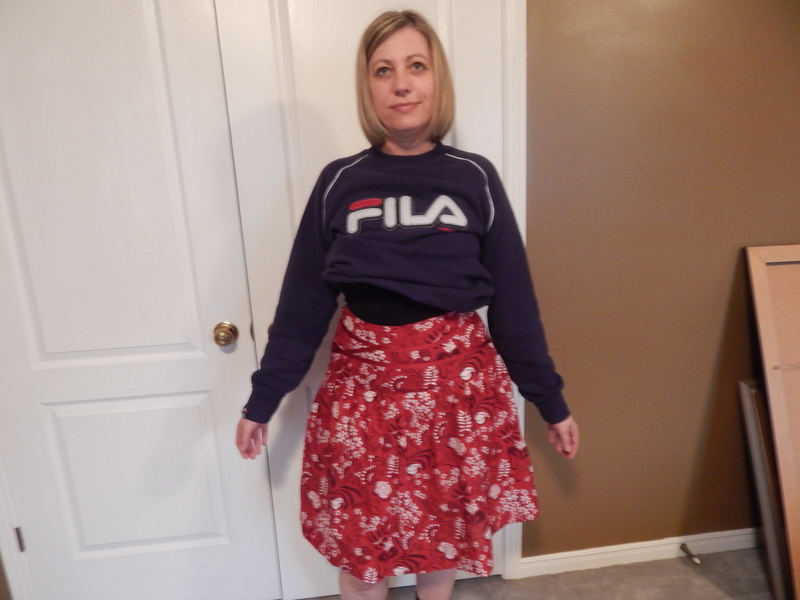 I thought I could use part of the elasticized upper portion as a waistband. 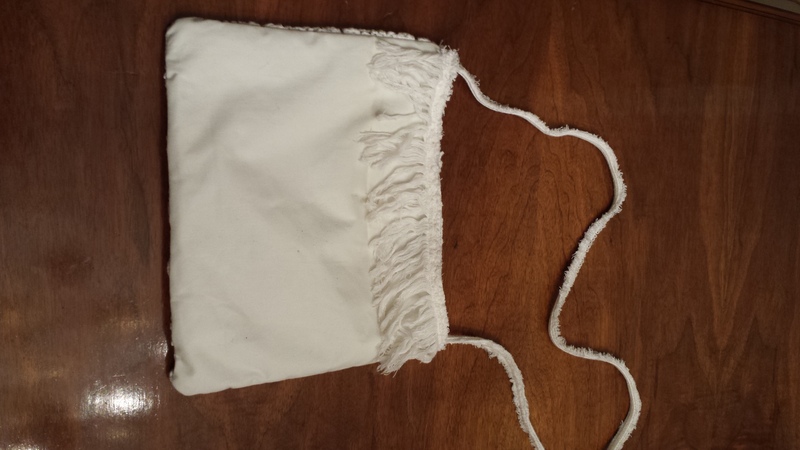 The bodice (or most of it anyway) had elasticized thread running through it and was stretchy enough to be a waistband. Mark and cut the new waistband. My idea wasn’t going to work since the bust area was not made up with elasticized thread. The whole thing would’ve looked wonky, so onto plan B: cut the bodice completely from the elastic waistband. I couldn’t unpick here as the elastic was stitched directly to the fabric. I knew I was going to end up with a raw edge. I don’t have a picture of what I did next. I wanted a way to cover whatever bits of fabric would be visible after I cut the bodice from the bottom. I remembered I had a stretchy black belt I wasn’t wearing so I stitched it right onto the waist to cover the raw edges. I had to put the skirt on and pin the belt while the elastic was stretched, otherwise I wouldn’t know how much to pull to get it to line up properly. 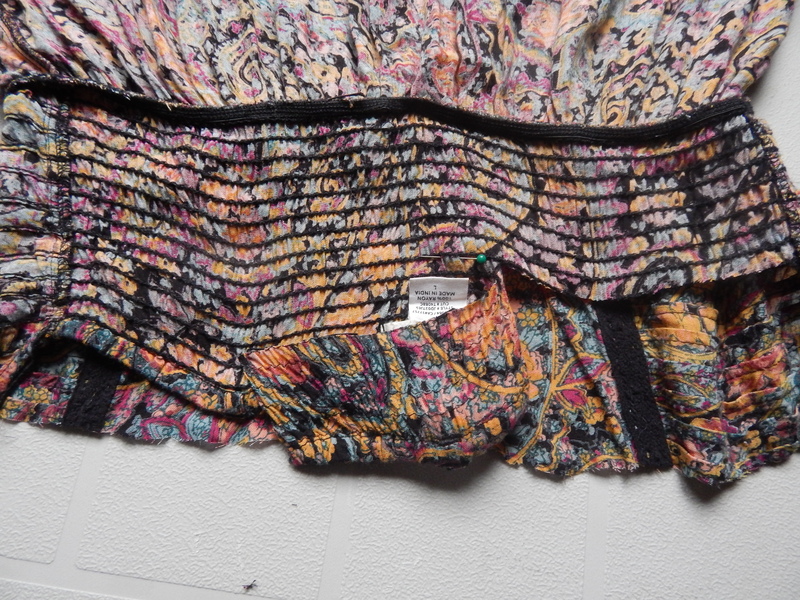 Elasticized belt stitched right onto the skirt. I hand stitched the belt all the way around by hand. It was a little tough to do near the buckle as it’s made from an imitation leather and so thicker and more difficult to stitch. I did the buckle up and continued stitching. This way, when I put the skirt on, the belt is already done up. It’s still not the perfect look for me but I think you can see the difference in the way my waist and hips look in each of the before and after pictures. Quite a difference. great for enjoying cool drinks on the deck! I’ve had this skirt for a long time and I’ve hardly worn it. I don’t know when I’m going to stop making the same fashion mistakes. Like buying skirts that are too “poofy” or baggy. If I’m truly honest with myself, all this fashion does for me is emphasize my hips. Ugh, those blasted hips! And it was too long, which automatically makes things 10 times worse. Anyway, last summer I hemmed the skirt to above knee and then put it away again til now.I wanted to keep it because I almost NEVER wear pants and in the summer I literally live in skirts and dresses. Shorts are really not my thing either. I know, I think I’m a rare breed. I just do not find pants comfortable at all and shorts? Forget it. Rarely do I wear them. Besides, it’s red! And I don’t have very many red pieces. 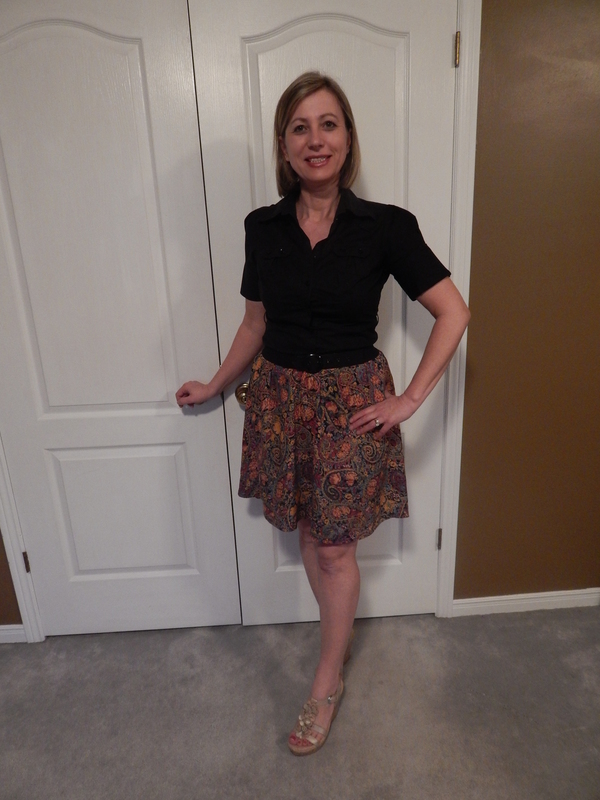 I don’t have a before picture of me wearing it prior to chopping the hemline, but here it is before I unpoofed it. Excuse the sweatshirt and lack of makeup. It was kind of late at night when I did this. No, I’m not trying to partially undress here, I lifted my shirt up to show the waistband. PS: sorry for the mess in my room-we’re repainting and there’s stuff EVERYWHERE! 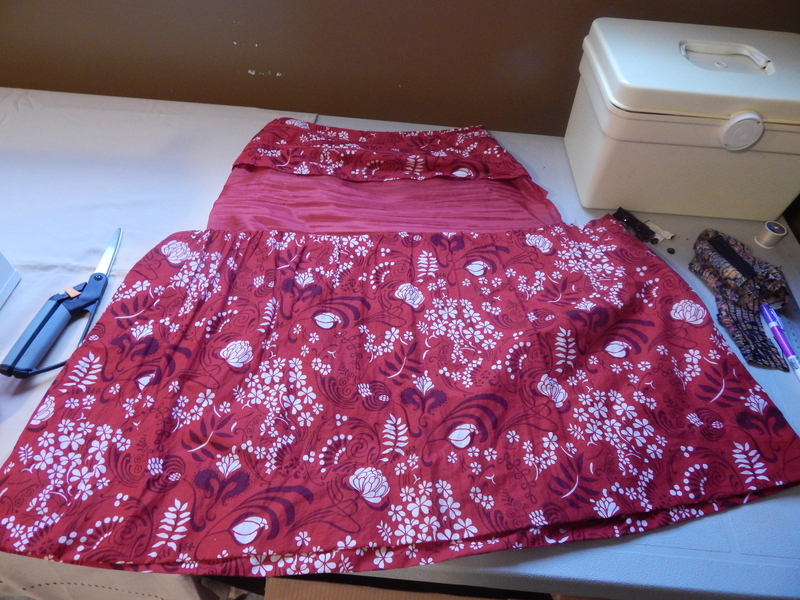 I began by removing the gathered part of the skirt with my seam ripper. Next, I measured how wide the new part needed to be. The zipper was on the other side of the skirt so I just left it the way it was. 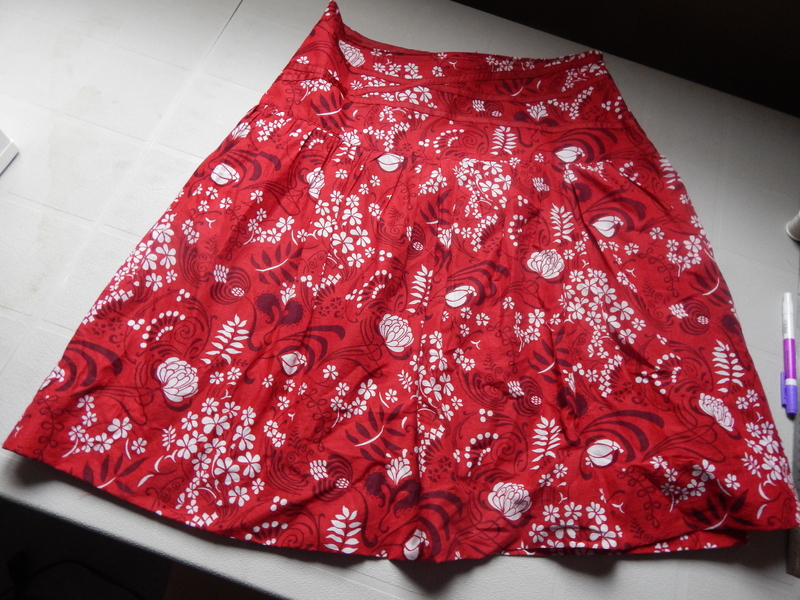 With the original top portion of the skirt and lining intact, I laid it over the piece I just unpicked. See all the fabric? That’s a whole lotta yardage! Pinned and sewed the new seam. 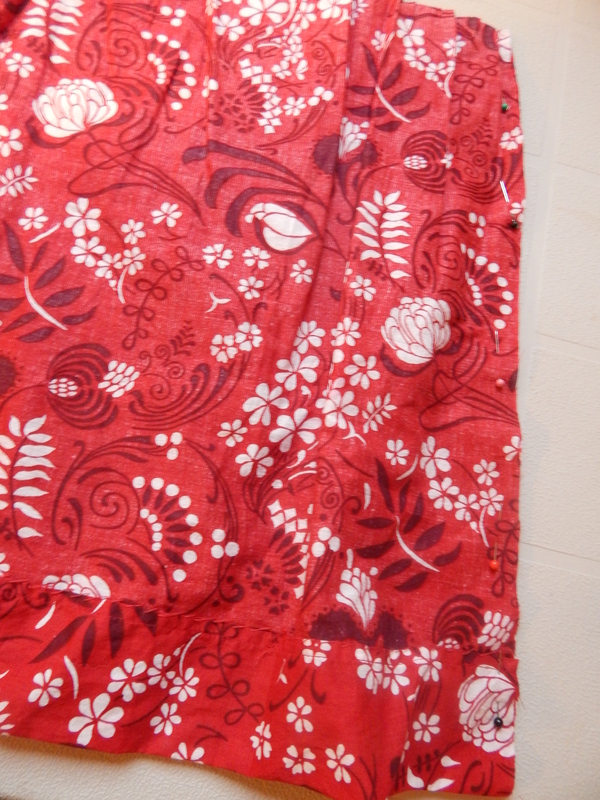 Then I prayed that the new piece would line up with the old piece-matching the side seams carefully. Attaching the new and old was a little tricky with the lining in the way. I kept getting mixed up which way was up, er I mean down, I mean right! Ever do that? Think you have it all figured out and realize you’ve sewn it all together upside down or backward or whatever? Luckily, that didn’t happen. Measure twice cut once and all that. i got it right the first time. I hope it warms up soon so I can take some outdoor shots. I think it looks way better now. Remember those cropped crochet cardigans?I didn’t know what to do with mine anymore so I grabbed my scissors along with some other bits and scraps and fashioned a quick and easy little bag. I really liked the pattern and didn’t want to throw the cardigan away but I knew I’d never wear it again. 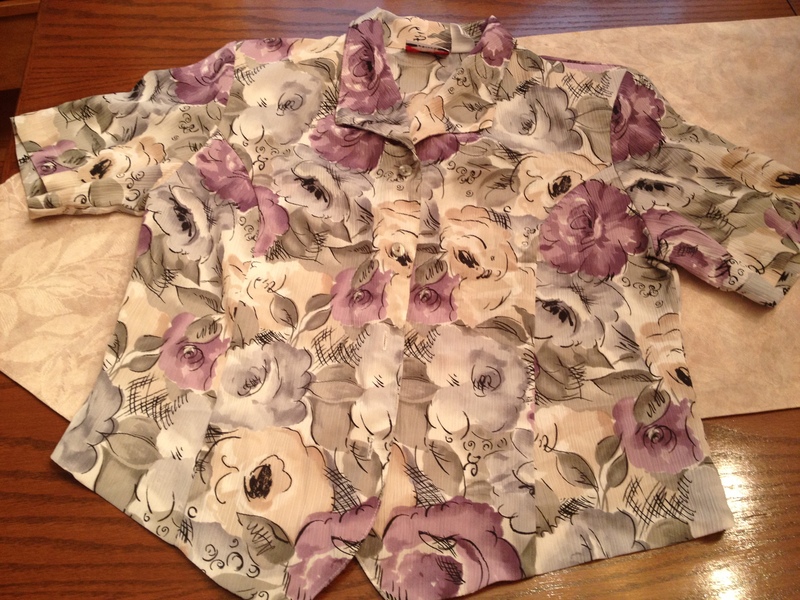 Unfortunately, I did this refashion at the end of last summer and forgot the before pic. I made the front of the bag from the back of the cardigan. 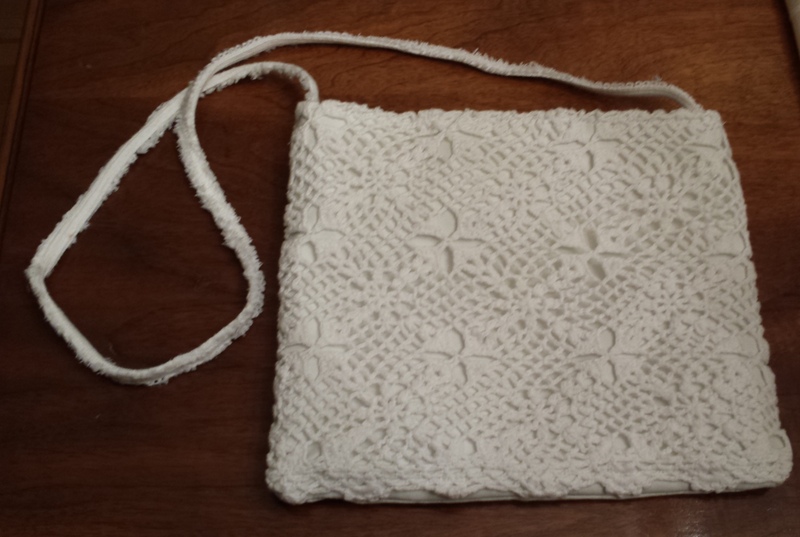 I sewed the crochet to some leftover drapery lining, then used some leftover tablecloth material for the inside lining of the bag. Here’s the inside of the bag. For the back, I had some fringe from a poncho. Remember ponchos? What to do with them now? I handstitched the fringe and used another piece from the same poncho to form a handle. Now it’s a super lightweight, grab it and go kind of cross-body bag perfect for the warmer weather. I love this dress! (on someone else’s body!) The colours, the pattern. It’s lovely and it’s Nine West. I love their shoes. I didn’t even know they made clothes. 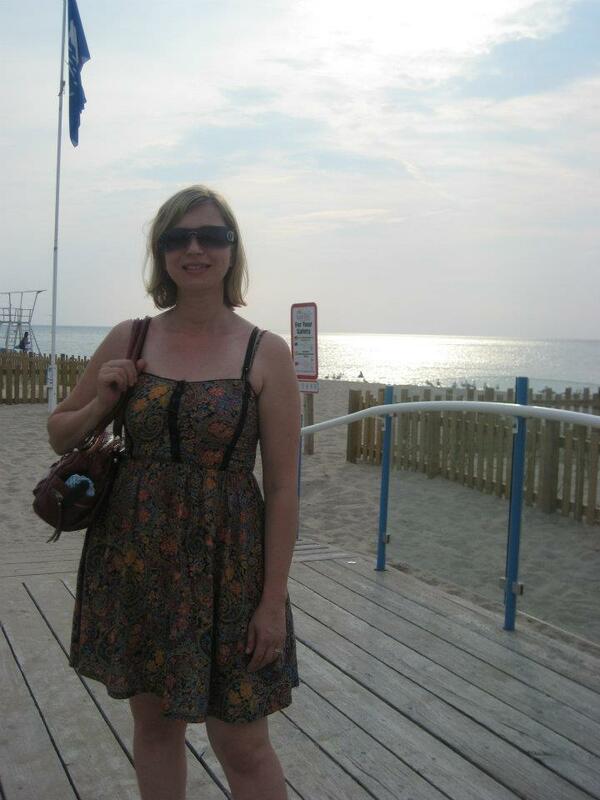 I bought this dress 8 years ago. Sorry about the ‘BEFORE’ pics. I chopped it without thinking I would need it for a post. 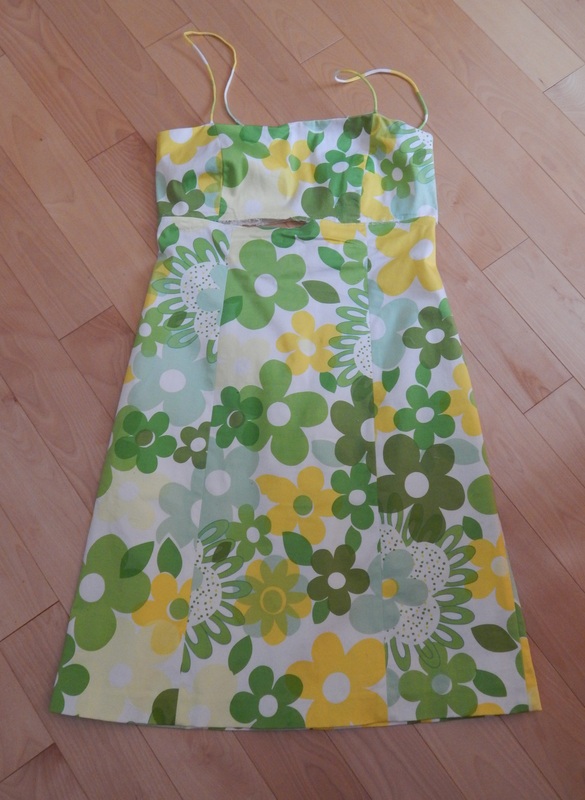 Basically, it’s a nice summer dress-bright, vibrant and fun (see picture of the back). It just detests my figure. I don’t know why I bought it (brand new). I even tried it on beforehand. Ever buy stuff without trying it on? I do. I don’t know what I was thinking. The only rational thought that comes to mind now is that I was about 20 lbs lighter then and I guess in my mind, I could wear whatever style and it would look fine-yeah right! This would look fabulous on someone with normal sized hips, I swear. The back was gorgeous with its wonderful tieback straps that left a bit of skin exposed. All I did was take out my seam ripper and remove the top piece and stitch the new waist closed. Now it’s a high-waisted skirt. So, I guess I’m hip now since I hear the world under 20 is into the high-waisted look of the 1980s. I didn’t even have to touch the zipper. It’s still not perfect. I’m working on it. No more ice cream every night. I could stand to lose a few. I may chop that high waist off and reposition the zipper to better fit me. We’ll see. Craving chocolate but going to fill up on water with a slice of lemon. Here’s a real easy restyle. I thrifted this blouse at Talize recently. I was drawn to the colours and print. I’m a sucker for florals. Love the lavender colours in this print. From the tag, I could tell it was probably from the 80s or 90s and suited for someone on the more mature side. I have a feeling it was probably separated from its skirted bottom somewhere in the donation pile. The 80s and 90s were notorious for these 2 piece sets. I went to work (this was going to be really quick). All I was going to do was remove the sleeves and straighten out the bottom so it was even. 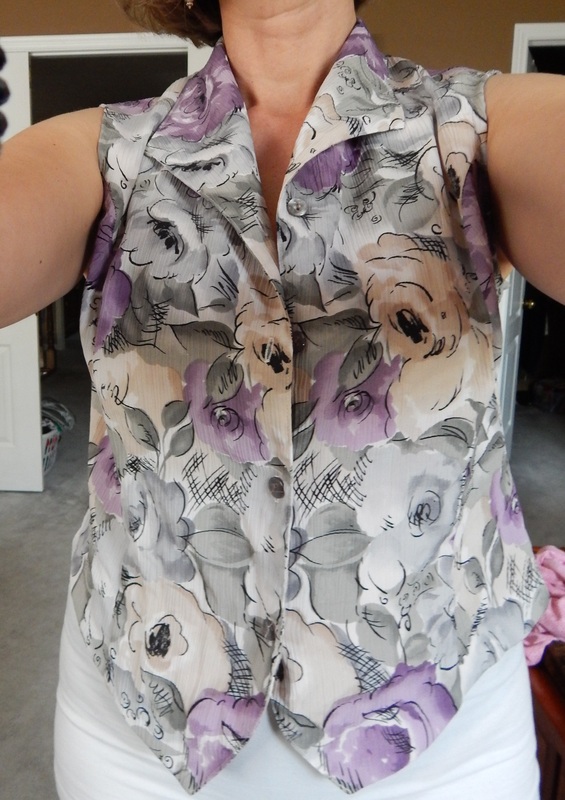 Then I tried it on and actually thought it looked cute as a vest, so I’m going to keep it this way. I intend to work it layered over a tank top or maybe even on its own with a nice light skirt or light coloured capri pants. 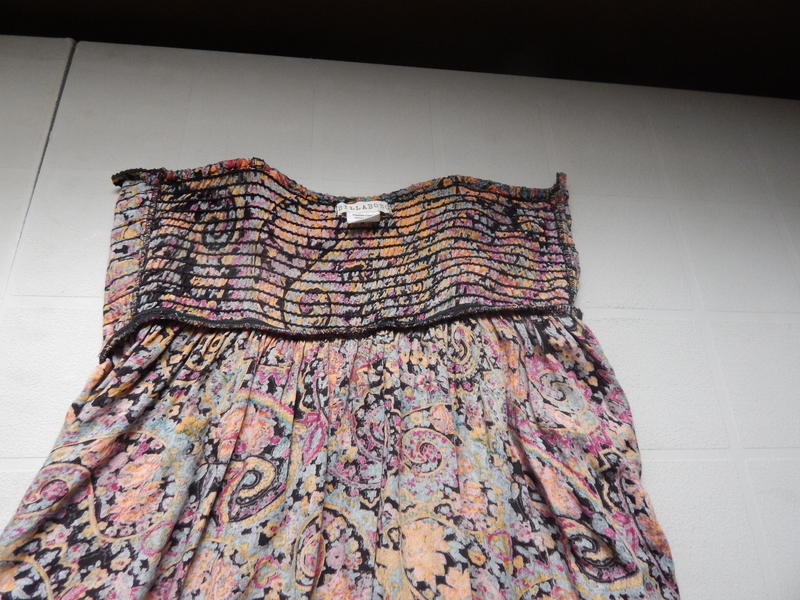 If you’re drawn to the colours and patterns in a garment and it’s in excellent shape (this one was-it looked like it had seen very little wear), I say go for it. I feel so pretty wearing this! My daughter and I thrifted this skirt. She really hasn’t taken to thrifting so I was surprised when she picked this out. 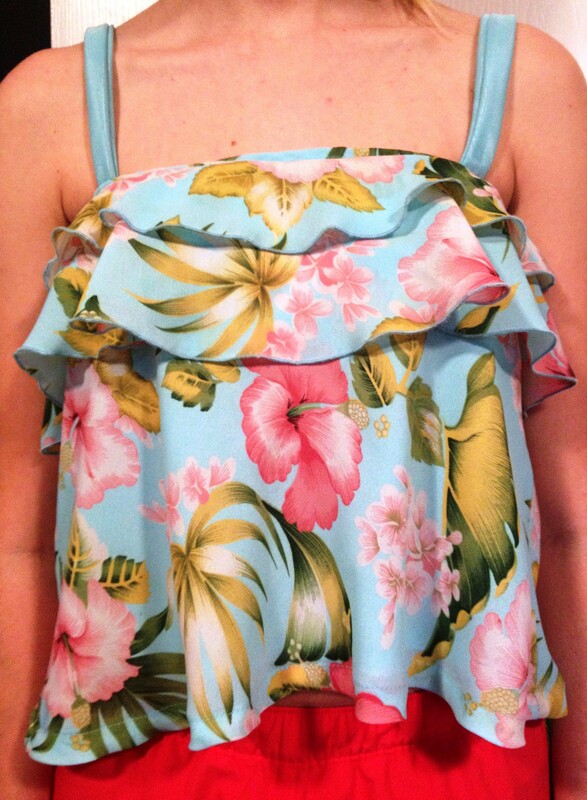 She loved the island inspired print so we decided it would make a nice top. 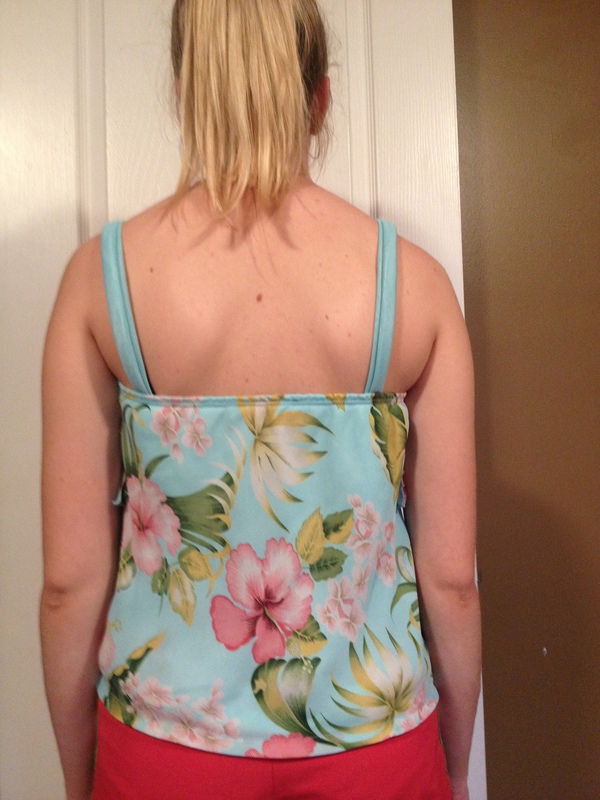 At first the intention was to turn it into a tube top, then I got a little more creative. I started by removing the ruffle along the bottom with my seam ripper, then I chopped off some of the length and sewed the new bottom hem. The elastic fit perfectly so I didn’t need to make any adjustments (yay! love that!) 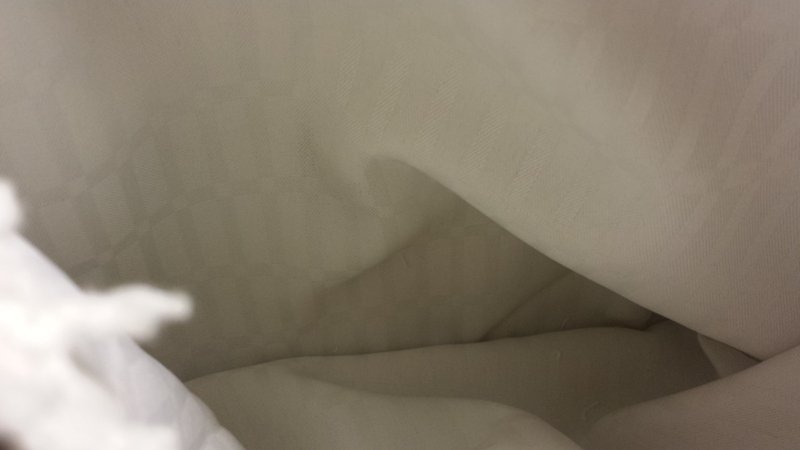 I cut and resewed the lining to shorten it as well. Next, I sewed the ruffle to the top. This took some trial and error to get it even. I thought it’d be a little easier but the ruffle was somewhat curved. Next, I began on the straps. I had intended to use the leftover floral print for the straps but the first time I cut the strips I made them too narrow and had a hard time turning them right side out so decided to use the leftover lining material to make new straps. I pinned and sewed those in place and aloha! 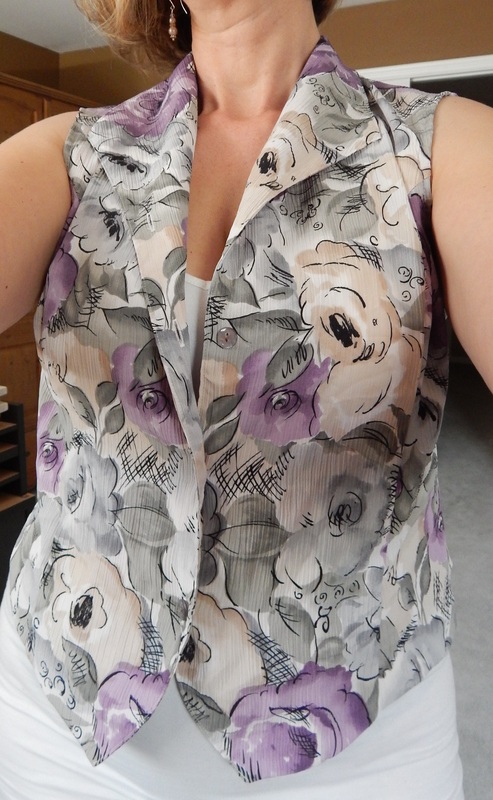 A new flowy, breezy tank top was born. 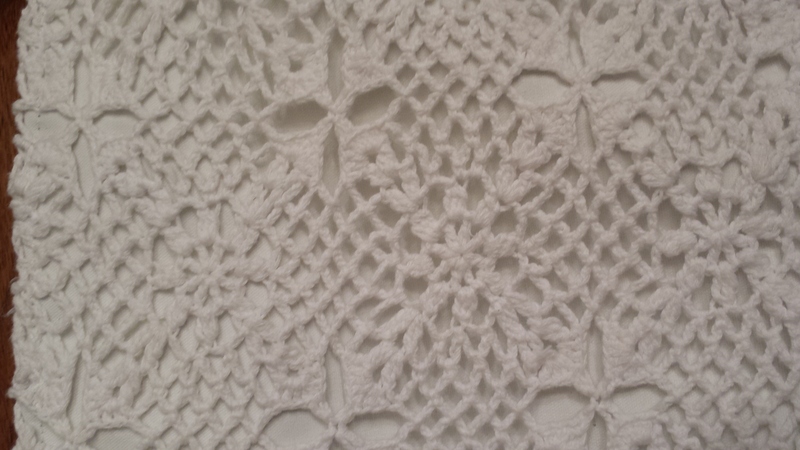 Back view-I suppose I could’ve continued the ruffle along the back as well but I thought it might look too busy. Well, here it is July and I’m still plugging away at refinishing that furniture. With the craziness of life and the on/off heat and humidity, I feel like I’ll never get done plus it leaves little time for sewing/thrifting. 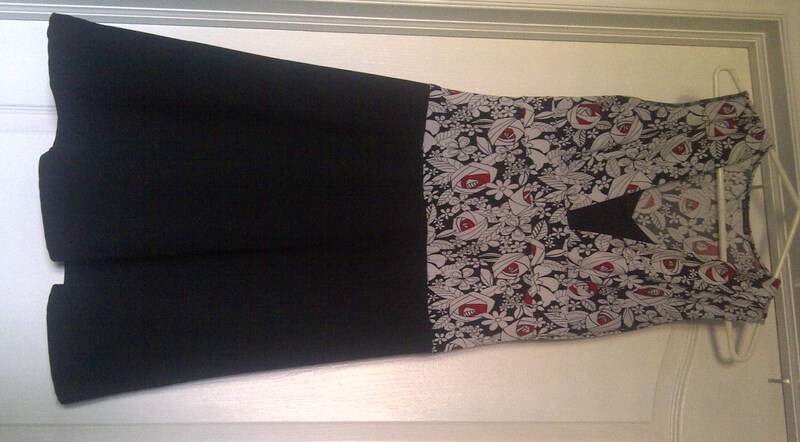 I do have this very easy top/skirt to dress refashion that I did a while ago. Actually, this was one of my very first wearable creations. The skirt is a simple black A-line skirt that had a zipper. I don’t have before pictures of the top or skirt but you’re a creative bunch. I wore the skirt quite a bit. The top is probably about 7 or 8 years old. I like the fit and the pattern. I don’t have much red in my wardrobe so I knew I wanted to keep it. It had short sleeves and ties at the back. For the refashion, I removed the sleeves and the tieback and chopped some of the length off. 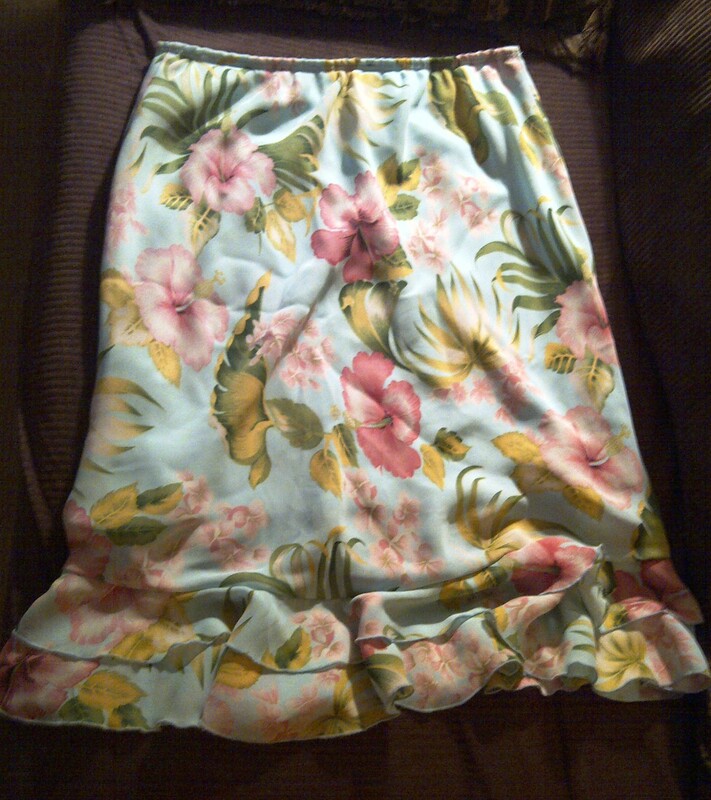 For the skirt, I removed the zipper and waistband and sewed up the seam. The fabric had enough give and stretch so a new zipper wouldn’t be necessary. 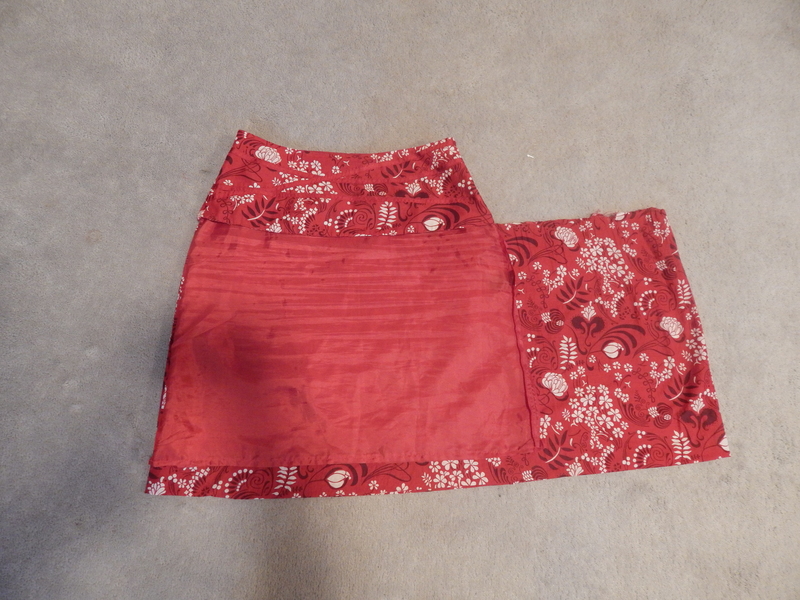 I then aligned the side seams to the side seams of the skirt and stitched the top to the skirt. Ta-da! An easy way to get some more life out of a couple of pieces. The last thing I did was finish the seam with some double-fold bias tape to prevent fraying.